The annual MDXmas Market is returning to campus this December. On Thursday 6th December, Middlesex Students' Union will be transforming the Scholar's Courtyard into a winter wonderland, featuring delicious food and drink, music, performances, festive fun and market stalls. The market will be part of a wider programme of MDXmas events and activities celebrating the end of term, starting from the end of November. Read on for more information on how you can be involved this year. HOST YOUR VERY OWN STALL AT MDXmas! All creators, makers and entrepreneurs are welcome - last year stalls included handmade jewellery, stationery, crafts/craft kits, hampers, sweets, clothing, hair accessories, candles, skincare, artwork, crafts, clothing, hair accessories and more. Stalls are available for FREE for Middlesex University students - you will just need to pay a £20 holding deposit which will be returned to you following your attendance the event. Limited stalls are also available to MDX staff members and local organisations for £30 - £40. This fee goes towards the cost of the stalls, enabling us to offer free stalls for students. To apply for a stall you will need to complete the MDXmas Market stall application form by Thursday 29 November. 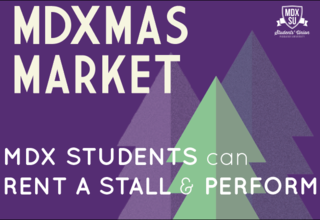 As well as the chance to sell, we're seeking student musicians and performers to take to the MDXmas Market stage througout the day!